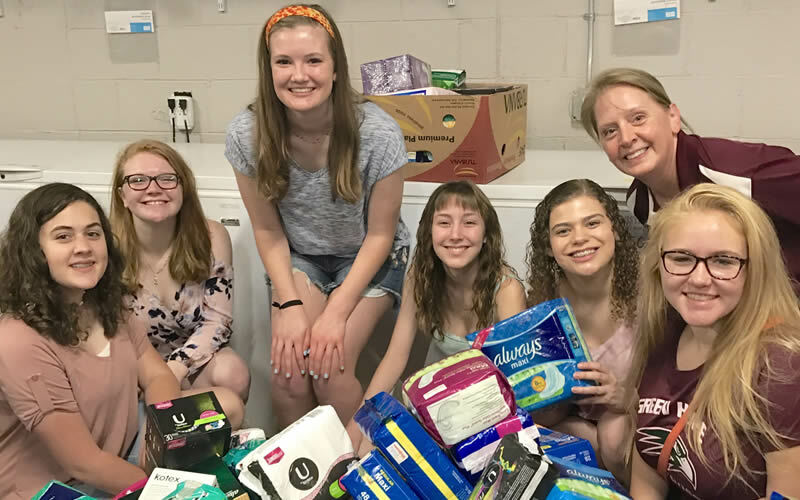 The Capital City Girls Choir at Meredith College (CCGC), has participated in a multiple-week drive for feminine hygiene products in collaboration with Tri-Area Ministry Food Pantry (TAM). The drive was led by choir member Rachel Oglesby, 16, who became interested in the need to help provide feminine hygiene products for those unable to afford them. “Most people complain about using these items because they are inconvenienced by their monthly cycle, never realizing there is another population that is inconvenienced because they must stay home from school or work because they simply can’t afford to meet their personal needs,” Oglesby said. The drive, which took place during weekly choir rehearsals during the months of April and May, saw the collection of 102 packages of feminine hygiene products. The donations were delivered to TAM May 20. These products will greatly benefit many women and girls across the Triangle as TAM serves approximately 700 households a month, which equates to 25,000 individuals served per year. According to TAM volunteer Leslie DuBois, products such as these are especially important because they are not covered by food stamps. TAM is the largest food pantry in the Wake Forest, Youngsville, and Rolesville area, and is a non-profit, non-denominational, 100 percent volunteer organization. A large number of their clients, which span across all races, age, gender, military service and family size, receive food stamps and many of them only receive $16 per month. TAM provides each family with a grocery bag of food containing about 12 assorted cans plus meat, a breakfast item, a dessert item and fresh produce items if they have them. If TAM has feminine hygiene items, diapers or baby food, they are also given out as needed. Each family may pick up the above items once a month. “We are in constant need of feminine hygiene products, diapers, canned foods and fresh food,” Dubois said. “Our third initiative we started this year is our Fresh Food initiative. Most of the food our clients receive is non-perishable, dry or canned food. While we are very grateful for these items and they are very much needed, we are also trying to provide our clients with healthier fresh food (produce, eggs, milk, cheese),” she said. Volunteers are always needed at the pantry which is open Monday and Wednesday, 9 a.m.-12:30 p.m. and also the third Saturday of each month, 9 a.m.-11:00 a.m. Volunteers must be at least 16 years old or 13-15 years old with a parent. The Capital City Girls Choir at Meredith College is a vocal and music training program for girls from Raleigh and the surrounding area, with the goal of teaching young women (fourth grade and up) musical and vocal skills. For more information about CCGC and the audition process, see capitalcitygirlschoir.org or send an email to info@capitalcitygirlschoir.org. For more about Tri-Area Ministries, contact Leslie DuBois at lesliejdubois@gmail.com or see triareaministry.com.